It is early in the North Dakota legislative session, but there already have been a number of bills related to the outdoors submitted for consideration. More are expected to be introduced in the coming days but here is a look at some of the outdoor type bills that are destined for increased scrutiny by various legislative committees at the state Capitol. At least four bills already submitted to the Legislature are directly related to hunting. House Bill 1209 concerns the use of dogs during the big game hunting season. Currently big game hunters are not allowed to have dogs in the field. HB 1209 would change that, but for the purpose of assisting a hunter in locating a downed big game animal only. The North Dakota Game and Fish Department has been aware that the bill would likely be introduced. It was a topic of discussion during the recent series of Advisory Board meetings held at eight locations in the state. Game and Fish has indicated they will remain neutral on the bill. The bill states that a dog may be used to help recover big game but, “The dog must be leashed and under the physical control of a handler at all times” and that the hunter “may not carry a firearm or archery equipment during the recovery.” In addition, if the animal is located and found to still be alive, the hunter must immediately notify a North Dakota Game and Fish Department warden. House Bill 1257 would permit hunters 65 years of age or older to use scopes with up to four power magnification on muzzleloading firearms when hunting deer. Current law restricts all muzzleloading optics to 1X. The bill mirrors one that was introduced at the previous legislative session and didn’t get out of committee. The limit of six volts ensures that the bill does not permit spotlighting. Currently fox and coyote can be hunted at any hour. Night vision optics and thermal imaging equipment is allowed, but use of any artificial light source is prohibited. Landowners would be eligible for gratis licenses to hunt moose on their land every year as proposed in House Bill 1357. Currently moose licenses are issued by application to resident hunters on a “once in a lifetime” basis. HB1357 reads that landowners of 150 acres or more would be eligible for an annual gratis moose tag provided the number of gratis licenses does not exceed 15 percent of the total licenses issued in the prescribed moose hunting unit. In moose unit M10 in 2018 there were more than 90 gratis applications for 16 available tags. Should the legislation become law it would allow successful applicants to pass their moose licenses to another party. Two bills have been introduced regarding the North Dakota Heritage Fund. House Bill 1066 would limit funding to $20 million per fiscal year. A key element to Senate Bill 2054 would remove the provision that a “higher priority be given to conservation practices” by requests for funding. 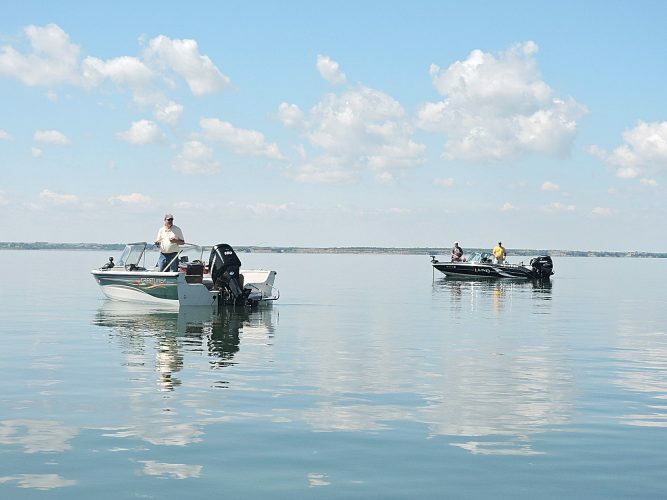 House Bill 1331 seeks to create a lifetime fishing license in the state. The bill asks that the Legislature “adopt rules necessary to determine eligibility and fees.” Federal aid dollars to Game and Fish are based, in part, on how many fishing licenses are sold in the state annually which appears to be one of the hurdles to be overcome should the bill become law. More outdoor-related bills could be brought before the legislative body in the coming days. The deadline to introduce bills in the House is Jan. 14 and the Senate Jan. 21.